When I last saw you, at the Venice Film Festival a year ago, you were about to start rehearsal on Eyes Wide Shut . . . and you're still shooting with Stanley Kubrick. Of course, you probably can't tell us anything about it . . .
C'mon. What can you say about it? I can tell you we're still shooting. That's no secret! [Laughs.] We'll be on nine months. But we've had two months off--we had a huge break at Christmas and at Easter. And what is the film about? Has your experience with Kubrick been worth all the time you've spent? Would you tell another actor your war stories, and then say go ahead and do it, work with him? Oh, absolutely. You do it for as long as he wants to shoot. Yeah, it's absolutely worth it. I love working with him. I said to him the other day, "It's going to be so sad when we've finished, I won't get to see you every day. You're like my dad." You really just relax into it. You can't fight it, you just go with it. That's the key. And also, things could be a lot worse than making a Kubrick movie. It really is a great honor to be able to talk to him and find out little things. And the way in which he works is so unique. And extraordinary. I really feel very privileged. Has it helped that it's you and Tom working together? Oh yeah, I think it would have been more difficult if one of us had been doing it and the other was still trying to find another job. That would have been tough. Okay, okay, we'll get to The Peacemaker now. George Clooney, who's a notorious prankster on his sets, says he didn't play pranks on you during the shoot. No. He was very good to me. He was a gentleman. But he was a forced gentleman, I made him be a gentleman. I said, "If you do something to me, I will pool all my resources and make sure that I do something that's ten times worse than anything you could ever think of"--and he was scared. [Smiles.] He'll say that he wasn't. But he was! He said, "Okay, we'll have a truce." What was your plan, in case he really did pull something? There was a time when there were all these female weightlifters that were in Bratislava when we were filming there. I was going to ask them before we left to go into his trailer and all be in bikinis. But then I thought if I did that, then I started it and I broke the truce and then it's all over. He said when he was walking around Bratislava with you and Tom during filming, everyone thought he was your bodyguard. That is not true! He's exaggerating. But it's such a good story . . .
All right, you can have it. Yeah, yeah, that's right. Yup! George also said that you were coming off of the Portrait of a Lady shoot, with Jane Campion, where you did fifty takes, and he was used to doing three. like this?" And he'd be like, "I'm finished--no, no, we don't want to do anymore." But we would laugh, and he was right there for me. They did laugh on the set because George is three takes and I'm twenty-five: "Let's exhaust this until we've tried it every possible way." 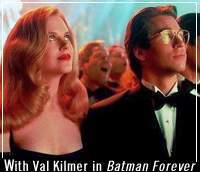 You've worked with two Batmen now, Clooney and Kilmer . . . I have. Don't ask me which one's better. I've got to be a diplomat, I like them all. There's one line in Peacemaker that's just delicious. Clooney comes in and you say, "Want coffee?" and he says yes and you say, "Go get it." There's an amazing action sequence that begins in a high-security mansion's office, zips down to the street as you and George make your getaway, then escalates to a chase to the death when the two of you, in a Mercedes, are pursued by killers in three BMWs. It's an amazing piece of kinetic filmmaking, and some pretty intensive car carnage. How was that to film? George loved doing that. How often do you get to crash a Mercedes--and not have to worry whether you're insured or not? [Claps her hands above her head like a cheerleader, squeals with delight.] Harder, harder, hit the BMW harder! The car's crashing--that's a kid's dream. That was really fun. I was holding onto the seat belt the whole time. And what was it like doing this big, explosive action picture and seeing Mimi Leder, a woman, sitting there directing? Was it any different? It was just fantastic seeing her! This was her first film and she just got out there and had such confidence. And the pace of the film. When I sat down to watch it, I was amazed at how fast the thing moves--and I know the story. She's really good.